You can make your pedometer or fitness band distance measurement more accurate by adjusting it for your average stride length or average step length. Fitness monitors usually have a default stride length they use for the distance estimate, with each step assumed to be covering 2.2 feet (26 inches) for women and 2.5 feet (30 inches) for men. You might cover more or less distance with each step, so adjusting this number will allow your pedometer to be more accurate in its distance reading. First, read the instructions for your fitness monitor or pedometer carefully. Most ask for the step length, although they may call it the stride length. Here's how to understand and measure this. The step length is the distance from the heel print of one foot to the heel print of the other foot during a walking stride. This is the distance traveled forward by a single leg. An average that you will see listed in many places is 2.2 feet (0.67 meters) for women and 2.5 feet (0.762 meters) for men, but it depends very much on height. Fitbit allows you to change the step length (which they call the stride length) using the Edit Profile function in the online Dashboard, or in the app under Account, Advanced Settings. Stride length can mean the same thing as step length, or it can mean the distance traveled by the heel of one foot to the next time that same foot strikes down. In other words, that would be two steps since in that time the other foot has also touched down once. If you set your pedometer for your step length and discover it seems to be halving your distance, read the instructions again. It may want the stride length, which is two steps. Also, in the reverse case, if you at first thought the pedometer needed the stride length but you seem to be getting double the distance, read again as they may have really wanted the step length. Rob Sweetgall of Creative Walking, Inc. touts this method of measuring step length to set your pedometer. Create a puddle of water on a stretch of sidewalk or street where you can be walking your natural speed before and after you reach it. Start walking at your natural pace and walk through the water. Keep walking naturally for about 10 more steps. Now measure the distance from the heel of your left footprint to the heel of your right footprint on several of the wet footprints and average them. If your pedometer is set in feet, divide the inches by 12 to get feet. Step length in inches divided by 12 inches equals your step length in feet. You can use this method in a hallway, gym, or large room. Measure and mark a known distance such as 20 feet or 50 feet. Get up to speed in your natural walk and count the number of steps it takes to cover that distance. Divide the number of feet by the number of steps. Feet divided by steps equals your step length in feet. If you use your step count over a longer known walking distance, it should give a more accurate average stride length measurement than the short walk method. Here are two suggestions. Use a football field, which is 300 feet from goal line to goal line. Divide 300 by the number of steps. Use a regulation track at the local high school. This is tricky because some are 1/4 mile, that equals 440 yards or 1,320 feet. Others are 400 meters, which equals 1,308 feet. You may have to locate and ask the coach which is correct for the track. Walk in the inside lane only. Count your steps. Divide either 1,320 or 1,308 by the number of steps. Use an online mapping app to draw and measure your walking route. Then check this against your pedometer reading. You could also use GPS-based walking apps on your mobile phone, but these are often off by 10 percent for distance compared with other forms of measurement. This method can be inaccurate because you start and end at a dead halt, which is not your normal stride. Make a mark at the heel of your right foot. Walk 10 steps, marking where the heel sets down on your tenth step. Divide that distance by 10. Smartphones have built-in accelerometer chips, and their health apps record a step count. You cannot adjust stride length directly with Apple Health and Google Fit. However, if you change your height it will change your stride length, which is used in determining the distance you walk. 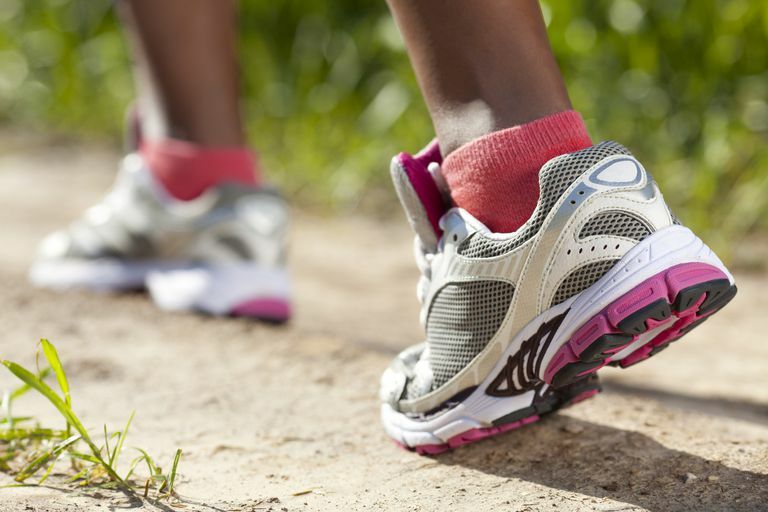 Dedicated pedometer apps may allow you to set your stride length for better accuracy. If your Fitbit fitness band seems to be counting too many steps, use the app or Dashboard to switch the setting to "Dominant Hand." That will decrease the motion sensitivity for arm motions. If it seems to count too few, change the setting to "Non-Dominant Hand." You can further adjust your stride length (which is actually your step length) via the Edit Profile function on the online Dashboard. In the app, it can be set in the Account, Advanced Settings, Stride Length menu. You can set both walking and running stride lengths, as they often are different. If the distance estimate seems inaccurate, use this function to set it for better accuracy. Fitbit: Help and manuals for the Fitbit Flex, Flex 2, Charge, Charge 2, Charge 3, Charge HR, Alta, Alta HR, Ace, Ionic, Blaze, Versa, Surge, Zip, One, Aria 2 and Aria Scale. Sportline: The company no longer has product information online. Omron: Product manuals are available by category or product name. Barreira TV, Rowe DA, Kang M. "Parameters of Walking and Jogging in Healthy Young Adults," International Journal of Exercise Science. Vol. 3 (2010) Iss. 1. Hatano Y. "Use of the pedometer for promoting daily walking exercise." Int. Council Health Phys. Educ. Recreat. 29:4 – 8, 1993. Hoeger WK, Bond L, Ransdell L, Shimon JM, Merugu S. One-Mile Step Count at Walking and Running Speeds ACSM’s Health & Fitness Journal, January/February 2008, Vol. 12, No. 1.